Drones at Work – Eyes in the Sky! Drones are now one of several technologies that are transforming every stage of the engineering and construction process. Its use does not only constitute to productivity boost, but every advancement in drone technology provides for better airspace awareness, transformative designs and more intelligent piloting modes. Surbana Jurong (SJ) is no stranger to drones which have many uses, from conducting inspections and surveillance, to security-led activities by AETOS (Member of the Surbana Jurong Group), and the Infrastructure team has been using drone inspection for land reclamation, and high precision data collection. SJ has introduced drones in projects across the entire building lifecycle, from planning & design to construction & operations, to improve overall operational productivity and effectiveness. As drone technologies (both hardware and software) become more developed, there is no doubt that drones help save time and hence, reduce overall costs substantially. Comparing with data collection from the ground; aerial techniques can provide more accurate site surveys, aerial data, photos, videos, thermal signatures, and other useful information in a fraction of the time. Traditional remote sensing studies require the academician to engage chartered manned aerial vehicle to capture dataset or make use of satellite imagery, followed by long man-hours to geo-tag, and lastly stitching of individual images to form an orthomosaic image. Modern drones can now be equipped with payload [ie, the weight a drone or unmanned aerial vehicle (UAV) can carry] such as high-resolution cameras, geo-location sensors, infrared sensors, LiDAR, and can also be highly customisable depending on requirement of datasets. Together with refined photogrammetry software, millions of key points can be generated within a short span of hours with minimum human intervention. So, How Do We Make Data Useful? First, we make use of the contextual information which can now be imported into a survey software to create 3D models of existing conditions. These models will help in determining feasibility, understanding constructability, and help owners visualise what the project will look like upon completion. It can also be used to identify areas of risk. Most work plans start with an accurate current topography map, with elevated contour lines and detailed 2D & 3D models for the Land Survey department, coupled with fill & earthwork hauling specifications for our Infrastructure department for rapid calculation. In this case, drones are used for surveys and inspections. And at a more progressive advanced stage, these activities will be enhanced with Artificial Intelligence, and further streamlined with Building Information Modelling (BIM) workflow. A recent example of a drone job of this nature was when SMEC (Member of the Surbana Jurong Group) Dams Team travelled to the Eungella Hinterland in North Queensland to conduct a site recce as part of the Urannah Dam Feasibility Study. At the site, a drone was used to capture video footages, which were subsequently used by the project team to carry out their studies and video conversion. And still shots have been incorporated in relevant sections of the report. From the end-user/client’s perspectives, drone surveys help inject real-world conditions into design and constructability conversations. The ability to easily capture site information improves the rate at which designs can be iterated on. 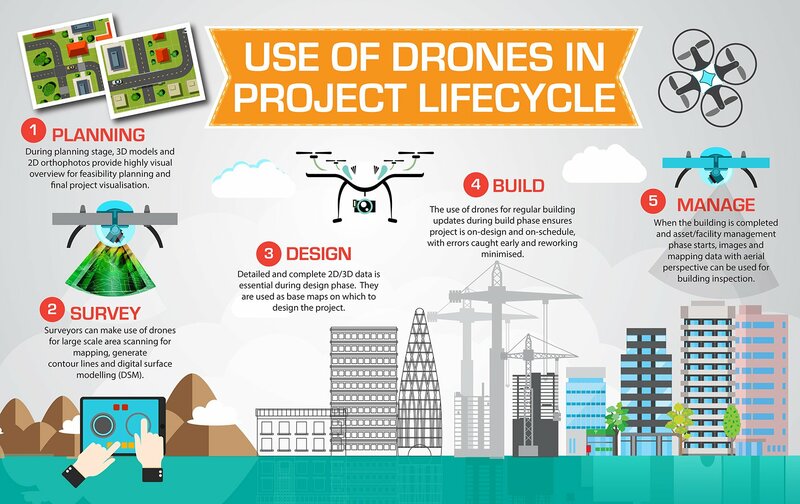 Please refer to illustration 1 on how drones can be utilised during a design and build project lifecycle. One simple method is to take an aerial shot of what potential tenants and investors would see when they look out from their office. This includes other visuals such as the reface views of the development, building models in the neighbourhood context, and even 180 or 360 degree visualisation from each floor. Construction jobsite monitoring can use drones to capture pictures for daily, weekly, and monthly progress reports, or site survey maps that provide foundation for work plans. Drone images used in daily progress reports are great for change detection: they can help uncover issues that allow site managers to quickly resolve problems that can lead to performance delays. Highly sensitive thermal camera can also be used as a payload in drone to assist facilities and security management teams in the creation of “live” data such as hotspot and water ingress behind façade. And in the case of security management, AETOS uses drones for crowd surveillance and general security at major events. “AETOS has accumulated extensive experience in providing state-of-the-art UAV Services to the Singapore market, ranging from security surveillance and safety inspections to 3D modelling, photogrammetry and even land surveying”, shared by Robin Littau, Vice President (Business Development) of AETOS Holdings. Robin continues, “Drones are able to complement traditional surveillance methods by covering larger areas, including blind spots while acting as a deterrent to illegal activities. Their versatility and reliability, as well as their potential to increase efficiency and productivity when used to aid ground operations, make UAVs a worthwhile investment for businesses in the security and safety industry”. BIM offers cost and time savings, creates greater accuracy in estimation, and cuts down on errors, alterations, and rework due to information loss. To reap the benefits of BIM, everyone in the architecture, engineering, and construction industries will have to learn to work in fundamentally new ways. As BIM-plus-drones is a whole new paradigm, taking small steps when implementing a BIM/drone data project is recommended. Choose the appropriate steps and tackle them one at a time. Do a test run on a pilot project, compare, and then use the pilot project to prepare for wider BIM/drone data implementation. The key takeaway for drone technology is the ability to collect data, and to execute the same mission over and over without causing huge disruptions operationally. A long-term cost and manpower saving tool for the build sector, it has survived the test of time, and has proven to cut down human and technical errors. The drone technology has undergone many generations of technological advancements. And what’s left really is how much the value chain can take to its use, and embrace it in tandem with the digital age.